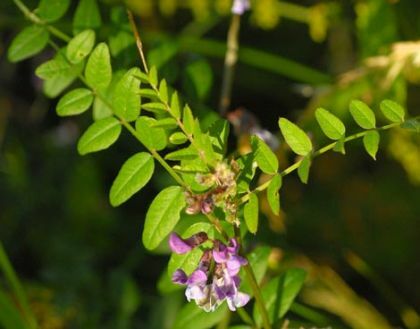 Bush Vetch is not easily confused with other wild plants on this web site. This scrambling plant uses slender, branched tendrils at the tip of its pinnate leaves to catch on to supporting plants. 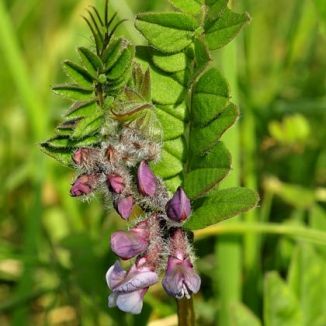 It does not have the splendid eye-catching colour of its cousin, Tufted Vetch, its colour belonging more to the dullish red side of the purple spectrum. Its 15mm long peaflowers grow on shortish stems in clusters or short racemes of 2-6 flowers and its leaves consist of 6-12 pairs of oval leaflets ending in tendrils as described above. It flowers from May to November and its seedpods are hairless and black. This is a native plant and belongs to the family Fabaceae. I first identified this plant in Roundwood, Co Wicklow in 1977 and photographed it in that same area in 2000. Extract from 'Ave!' (An ode for the Shelley Centenary 1892) by Charles G D Roberts 1860 – 1943.